On a somewhat regular basis, site owners report in the Google Webmaster Help Forums about using the Remove URL tool for website cleanup, only to inadvertently remove the entire site (or most of it) from the Google search results. Yes, Google does take those Remove URL requests pretty seriously, and removes those URLs (or the site!) very quickly. There’s also been times that a well known site has suddenly vanished from the search results, only to return within a day or two. 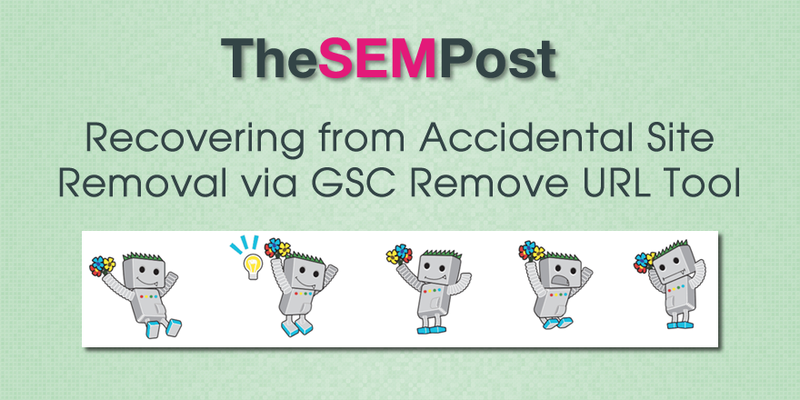 While often SEOs looking into it speculate that it was a manual action that was lifted with an extremely fast turnaround, the misuse of the remove URL tool could also explain some of these cases. Yet another webmaster posted in the Google help forum about accidentally removing most of their site using the remove URL tool, and John Mueller made a couple noteworthy comments. First, once a remove URL request has been removed from Google Search Console, via the “Reinclude” link next to each removal, and the status changes to cancelled, it only takes about a day for a site to recover. The other comment was regarding site variations. Mueller said that a site removal request in one of the domain variations would apply to ALL domain variants. So a site removal request for the http://example.com would also apply to http://www.example.com as well as for the https variations as well. It looks like you still have a site removal request open for the http version of the site. This would apply to all variations (http/https/www/non-www) as well. Once that’s canceled, things should settle back down within a day or so. His comment also stresses that site owners shouldn’t use it to remove their non-preferred domain version in the search results if it is indexed, something many site owners have attempted to do. Redirecting non-preferred URLs to the preferred one, as well as setting the preferred domain option in Google Search Console would be the best way to handle this situation. This tool should definitely be used with an abundance of caution, and it shouldn’t be used just for typical URL changes or page removals that are now 404s. All to often, site owners don’t realize how much hurt they can inflict on a site when they use the remove URL tool. Site owners have done things like removed the http://www.example.com/ URL because they didn’t like their homepage appearing in the search results with the trailing slash, with dire consequences. Google has a whole section on misuse of the tool in their help section. Because these cases do come up with regularity, it would be nice if Google placed a warning on the remove URL tool page for webmasters who aren’t familiar with the tool, or at least a link to the misuse section so webmasters are better educated about when they should or shouldn’t use the remove URL tool. For some reason, Google Search Console doesn’t have a link to the documentation for the tool from the remove URL tool page, only to the documentation about blocking Googlebot from content. Ideally, adding a “WARNING: You might accidentally remove your entire site from the Google index with this tool. Click here to learn how to use the Remove URL tool and when you should and should not use it to remove a page from the search results.” Right now, there is no warning about the mayhem a site owner can inadvertently cause to their site. So when should the remove URL tool be used? It should only be used in cases where it is extremely critical that the information be removed immediately, such as a database file with credit card numbers in plain text accidentally ended up in a file on the site that Google discovered and indexed, or delicate personal information that should not be found in the search results.